THE UNITED STATES CAPITOL BUILDING, Taj Mahal and Basilica di Santa Maria del Fiore all have their admirers, but for CabbieBlog standing head and shoulders above them all is the largest Cathedral in England, Sir Christopher Wren’s St. Paul’s Cathedral. It is remarkable that St. Paul’s should have been built under the supervision of only one master-builder, Thomas Strong and one architect. Construction took over 35 years, so long in fact that a lazy workman at the time would have been called a St. Paul’s workman. In Florence no building is allowed to dominate its beautiful cathedral. It’s a simple principle that has enhanced their city. Unfortunately this has not been the case in the area surrounding St. Paul’s. The buildings after the Second World War were dire and it has only been after the intervention of Prince Charles that adjoining Paternoster Square, completed in 2003, is harmonious. 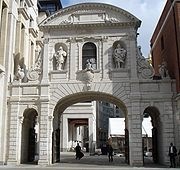 The arch connecting Paternoster Square to St. Paul’s is Temple Bar designed by Wren and originally positioned at the western end of Fleet Street as a ‘bar’ to people approaching the City of London. In 1880, a brewer Sir Henry Meux bought the stones (at the instigation of his wife, Valerie Susan Meux, a barmaid he married amid much scandal) and re-erected the arch as a gateway at his house, Theobalds Park, between Enfield and Cheshunt in Hertfordshire. It remained there, incongruously sitting in a clearing in a wood, until 2003. Before satellite imagery, before airplanes, and before photography, the only way of obtaining large-scale and factual panoramic views was to get to a good observation point and draw away. Thomas Hornor did just such a thing in 1821: taking advantage of the cross being removed for cleaning from the top of St. Paul’s, he somehow convinced the powers-that-be to allow him to construct an observation post for himself in its place for a long term, uninterrupted and altogether fabulous view of the city of London. He set up shop up there, about 400 feet above the ground, in a shack that was, well, not the safest-looking construction ever to grace atop a cathedral, making minutely detailed drawings of the cityscape, working with a telescope and a great deal of reserve. The end result was an enormous, fantastically detailed acre-sized painting which was installed and displayed in a pleasure dome on a site between Albany Street and Cambridge Terrace, on the fringes of Regent’s Park. It was eventually to be called the Colosseum and it was conceived on a suitably grand scale. 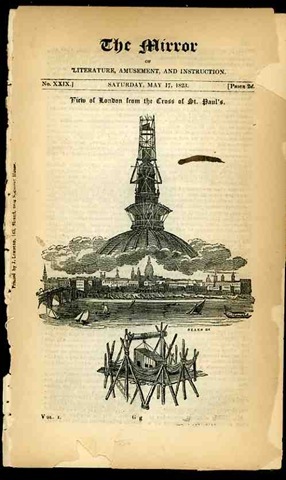 Designed by a young architect called Decimus Burton, its central feature was a rotunda with a dome 30 feet wider than St. Paul’s and 112 feet high at its apex. The installation was as much an artwork as the painting – it was affixed to the walls and people would view it from a multi-story observation deck in the middle of the building. For those who didn’t want to climb the stairs to get to the viewing room, an ‘ascending car’ was fabricated, making the structure one of the earliest buildings to have an elevator. There is some sort of irony in that: people would pay to see a painting using London’s first elevator to get to the top of a small structure inside another structure to see a painting made from the top of a large structure of a scene that could be viewed for free by walking outside. Nonetheless, the fantabulous painting was viewed by more than a million people before moving on. Terrific story. I knew about the observation post atop of St Pauls’, I also knew of the Colosseum (I think the building still stands) but I never knew the two were connected. I had forgotten about the story, having written it nearly 10 years ago, before re-posting it here.